This is Linda Franz's site for Inklingo—downloadable shapes to print on fabric (or for paper pieces)—Lucy Boston, Millefiori Quilts, Quilted Diamonds & Jane Austen. Watch the seventh LIVE Inklingo Video on the All About Inklingo blog. It's all about how to print and sew stars! If you know what you want, click on the letters to see the alphabetical listings in the SHOP. Inklingo is for creative quilters who want to get precise results faster, so they can make better quilts AND finish what they start. 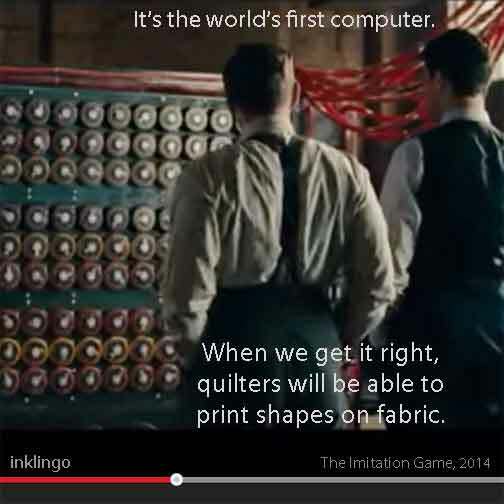 QUILTERS LIKE YOU LOVE USING INKLINGO! One quilter's review gives negative two stars, not five stars. to all quilters, especially to viewers of QNN TV and those who discovered Inklingo through my blog or QuiltingHub or Canadian Quilt Talk or Pat Sloan's Creative Talk Radio, or Bonnie Hunter's Quiltville. Buy The Inklingo Handbook and get $10 off your next order! There are 5 STAR REVIEWS for each item in the Shop. See examples for the free shape collection. Everything I see and do seems to have something to do with quilting. "Like" Inklingo on Facebook & choose "get notifications" for fresh photos daily! You can sell Inklingo downloads and books! Inklingo Affiliate Program.